Agreement calls for constitutional reform and new elections. Details of a peace agreement between the Ukrainian government and protestors were released Friday night, ending several days of intense fighting that left dozens dead. The agreement was signed by Ukrainian President Viktor Yanukovich and the leaders of the three opposition factions in the parliament, the Verkhovna Rada – UDAR’s Vitali Klitshchko, Arseniy Yatsenyuk of Fatherland, and Oleh Tiahnybok from Svoboda. Foreign Ministers Radoslaw Sikorksi of Poland and Frank-Walter Steinmeier of Germany certified the agreement on behalf of the European Union. The agreement calls for the beginning of a constitutional reform process, to be completed by September; the formation of a new government by March; and early presidential elections, to be held before December. The agreement also stipulated that the government would not declare a state of emergency. Some groups of protestors were not satisfied with the deal, which allows Yanukovich to remain in office until at least the end of the year. As part of the deal, the Verkhovna Rada voted to restore Ukraine’s 2004 constitution, in which the president is less powerful than the parliament, and passed a bill giving those involved in the protests immunity from prosecution for acts committed during the chaos. The amnesty bill was approved by 372 members of the Rada, including 127 from President Yanukovich’s Party of Regions. 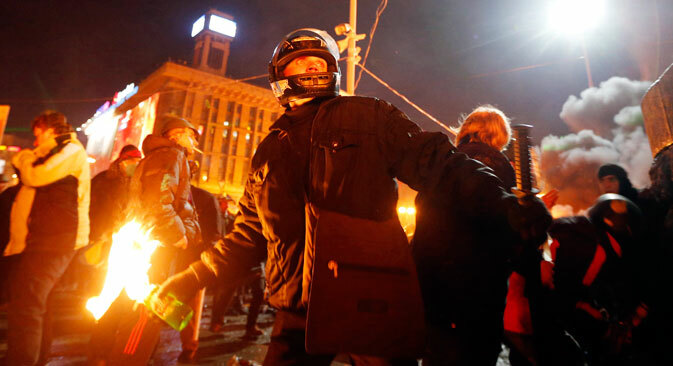 Yanukovich declared Feb. 22 and 23 days of mourning for the victims of the violence. In a surprise move later in the day, the Rada also voted to release former Prime Minister Yulia Tymoshenko from prison by decriminalizing the offense of which she was convicted. In a sign that Russia was not completely happy with the agreement, the country’s human rights ombudsman Vladimir Lukin said that consultations would continue, and that any future agreements would be decided in Moscow. “I did not sign the agreement settling the Ukrainian crisis,” Lukin said, according to Interfax. The Council of Europe, however, welcomed the agreement, and said it was sending a group to Kiev next week to begin consultations on the constitutional reform. “We are ready to forthwith take upon ourselves to provide help in order to achieve the objectives reaffirmed in the agreement, in particular, by providing legal and constitutional expertise on the subject of a constitutional reform through the CoE Venice Commission and the International Advisory Group,” CoE Secretary General Jagland Thorbjorn said in a statement.